Hope you all had a great weekend. Mine went with sleeping and shopping. You know what? Now a days I am starting to feel guilty if I dint post at least 1 recipe a day. I hope everyone is feeling the same. Yesterday I couldn't post and I felt as though I did something wrong :) Anyways today I have come up with the simplest yet a scrumptious recipe made with rice. Yes you got it right- Jeera rice. whenever I feel lazy or had to cook something very fast I go with this jeera rice recipe. Heat the oil/ghee in a pan. Add cumin seeds, green chillies, cashews. Fry ill the cashews turn light brown. Add onions and saute till they are light brown. Now add coriander leaves and mint leaves. Add water and let it come to a boil. Now add the soaked rice and saffron colour and salt. Mix well and let it cook in Sim flame. 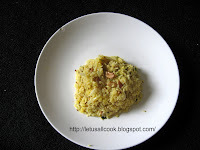 since the rice is already soaked it will take only 10-15mts to prepare this recipe. Note: You can also do this jeera rice recipe the same way in a rice cooker. hi sangeeth....i love jeera rice..even i posted one recently...ur version sounds wonderful!!! i wanted to send my dal makhani for ur event but forgot..can i still send it..i posted it on sunday..
Jeera rice is one of my favorite recipes. In my city, I have tasted this in few restaurants and couple of them were wonderful. Thanks for sharing this recipe! 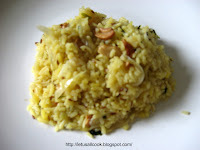 Jeera rice is one of my favorite recipes...Thanks for sharing this recipe!! !